Type 1 diabetes occurs because the insulin-producing cells (called beta cells) of the pancreas are damaged. People with Type 1 diabetes produce little or no insulin, so sugar cannot get into the body's cells for use as energy. This causes blood sugar levels to rise. People with Type 1 diabetes MUST use insulin injections to control their blood sugar. The damage to the insulin-producing cells in Type 1 diabetes occurs over a period of years. 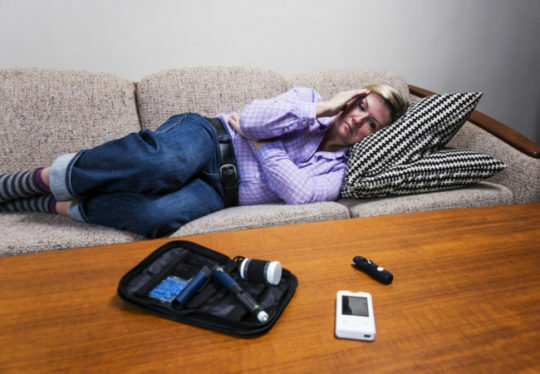 However, the symptoms of Type 1 diabetes might occur over a period of days to weeks. Type 1 is the most common form of diabetes in people younger than 20 years old, but it can occur at any age. People with Type 2 diabetes produce insulin. However, there is either not enough insulin or it doesn't work properly in the body. When there is not enough insulin or the insulin is not used as it should be, sugar cannot get into the body's cells for use as energy. This causes blood sugar to rise. Type 2 diabetes is most common in people over age 45 who are overweight. Some people with Type 2 diabetes can manage it by controlling their weight, watching their diet and exercising regularly. Others might also need to take an oral medicine and/or insulin injections. Gestational diabetes is a high blood glucose level that occurs during pregnancy. As pregnancy progresses, the developing baby has an increased need for glucose. Hormone changes during pregnancy also affect the action of insulin, resulting in high blood glucose levels. Usually, blood glucose levels return to normal after childbirth. However, women who have had gestational diabetes have an increased risk of developing Type 2 diabetes later in life.